The following procedure outlines the steps needed to deploy the Google Sites connector. The steps indicate the order in which you must perform configuration tasks on both the Google and Coveo servers. Validate that your environment meets the requirements (see Google Sites Connector Requirements). On the Google console, authorize the Coveo connector to access your Google Sites. You must create a Google API Console project to grant the connector access to the Google Sites that you want to index (see Granting the Connector Access to Your Google Sites). The Coveo connector needs an account to crawl your Google Sites content. For this purpose, select an existing Google Apps account or create a new one. When you want to index permissions, the crawling account must have administrator rights because ACL Feed access is required. When you do not want to index permissions, an account that has read only permissions to the whole content that you want to index is sufficient. Create a CES user identity that contains the credentials of your Google Apps crawling account (see Adding a User Identity). When you want to index Google Sites site-level permissions, you must create two security providers to get permissions and, resolve and expand groups. In Google Sites, users are identified by their email addresses. Consequently, permissions returned by the Google Apps security provider for each document are email addresses. The Google Apps security provider then requires another security provider to uniquely identify users from their email addresses. When authenticated with their email address, use an Email security provider with no user identity (see Configuring an Email Security Provider). When authenticated with an Active Directory account, use an Active Directory security provider (see Configuring an Active Directory Security Provider). An Active Directory security provider is appropriate only when the User Principal Name (UPN) matches the email address for all users. CES comes with an Active Directory security provider that you can configure to connect to the default domain. When your environment contains more than one domain, you can select an Active Directory security provider that you created for other domains. Create a Google Apps security provider that the connector uses to resolve indexed permissions (see Configuring a Google Sites Security Provider). CES 7.0.7104– (October 2014) Optionally, when you want to index Google Sites metadata, create a custom mapping file. 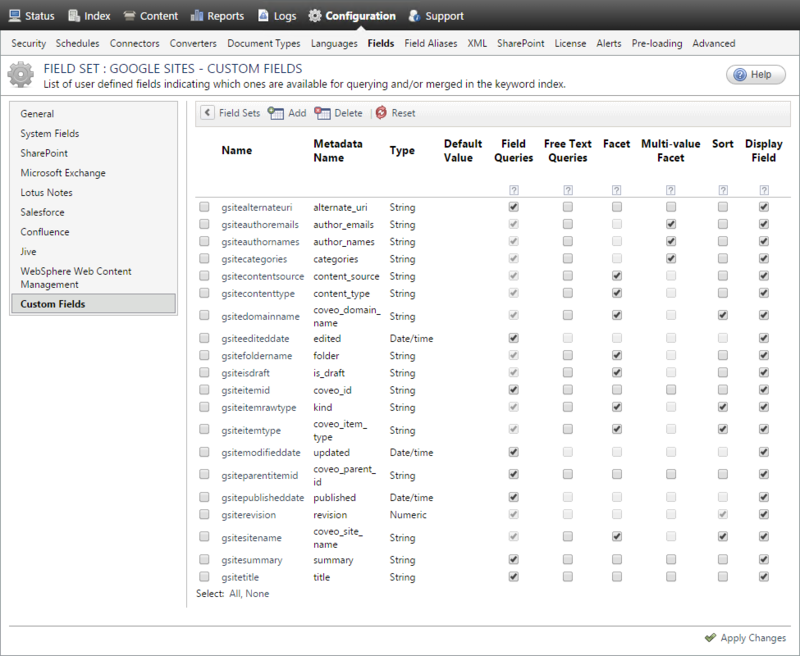 A sample mapping file defines a few custom Google Sites field that can be used to create a rich Google Sites search interface, for example, providing more specific facets (see Creating a Custom Google Sites Connector Mapping File). Note: CES 7.0.7183+ (November 2014 ) The Google Sites connector comes with a default mapping file (see Configuring and Indexing a Google Sites Source). Create a Google Sites field set to take advantage of the available Google Sites metadata. It is recommended to start by importing the default Google Sites field set file ([CES_Path]\Bin\Coveo.CES.CustomCrawlers.GoogleSites.FieldSet.xml to be able to easily add Google Sites specific facets to your Coveo search interfaces (see Exporting and Importing a Field Set) . Note: CES 7.0.7104– (October 2014) It is recommended to download the zipped Google Sites sample Field set XML file, and import it in CES (see Exporting and Importing a Field Set). The sample Google Sites field set defines the custom fields that match the custom fields defined in the sample mapping file. Configure and index a Google Sites source. The connector must know details about the authorized access to the Google Sites of your users to index its content (see Configuring and Indexing a Google Sites Source). If you encounter issues, verify if modifying the default value of hidden source parameters can help resolve the problems (see Modifying Hidden Google Sites Source Parameters).